1st Place and 2nd go to ASU’s Men’s 400 Free Relay. TEMPE, ARIZONA (January 10, 2015) Arizona State University’s men swimming and diving team squeeze out a victory by taking first and second place in the final event of the meet, the 400 free relay, against the Brigham Young University Cougars for a final score 151 -148 at Mona Plummer Aquatic Complex on Saturday, January 10, 2015. Going into the final event, the 400 Free Relay, ASU’s men were down by 10 points. ASU had two relay teams and BYU fielded three. It would take a stellar performance by both relay teams, requiring them to place first and second to take the meet. ASU’s “A” team, consisting of Patrick Park, Tadas Duskinas, Sean Kao, and Joe Worrick took the lead and never looked back. ASU’s “B” team, consisting of Thomaz Martins, Cole Miller, Juhan Hong, and Narkley Perry, was on “A” teams’ heels but were never able to gain ground, finishing a comfortable lead in front of BYU’s “B” team, consisting of Seth Russell, Levi Jensen, Matt Abernethy, and Michael King. 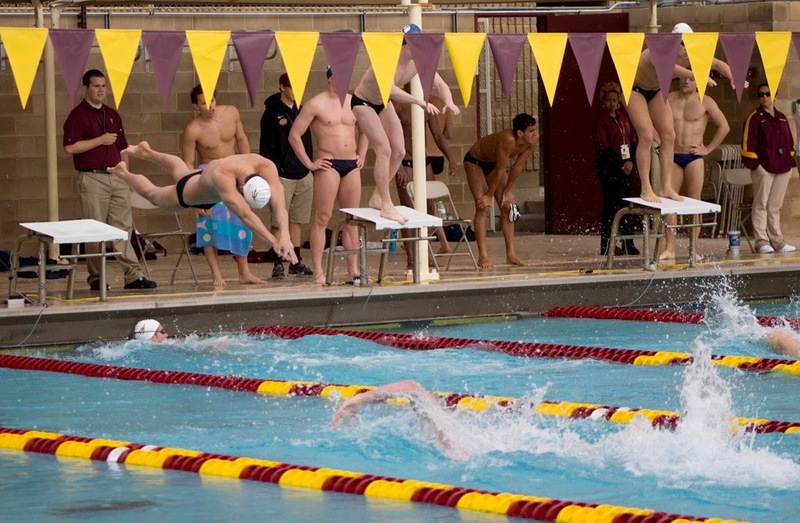 ASU men's diving contributed to the team’s comeback victory against BYU when David Hoffer placed third in one meter diving and first place in the three meter diving. Hunter Atha placed third in the three meter event bringing the total diving contribution to 15 points. ASU’s women defeated BYU by a score of 182 – 111. Key performances by the women included first place finishes in 200 yard medley relay, 1000 yard free, 200 yard free, 100 yard back, 100 yard breast, 200 yard fly, 50 yard free, 100 yard free, 200 yard back, 200 yard breast, 500 yard free, 100 yard fly, 1 meter diving, 200 yard Individual Medley, and the 400 yard free relay. The Cougars will be hosting Denver on Saturday January 24 at the Richards Building Pool in Provo. ASU’s next home appearance is against PAC-12 rivals Cal and Stanford on Jan 23 and 24 at 12 P.M. AZ Time.